Contributor Rob Stoakes takes on his first MM Top 5 with a look at a selection of Marvel characters that should probably join the Avengers – and why they probably won’t even get their own movies. …and also why it probably won’t happen anyway. This is a character who’s entire thesis is summed up in her name; She-Hulk. Hulk, but a woman. However, in an interesting spin, Jennifer Walters has one thing her cousin Bruce Banner doesn’t; she doesn’t lose any control. As such, she chooses to be She-Hulk, because if the only downside to becoming an Amazonian beauty who can bench press a truck is that you turn green, then sign me up. Another interesting diversion from Hulk is that her series is a comedy, which would bring her closer to Guardians of the Galaxy than 2008’s Hulk in terms of tone. 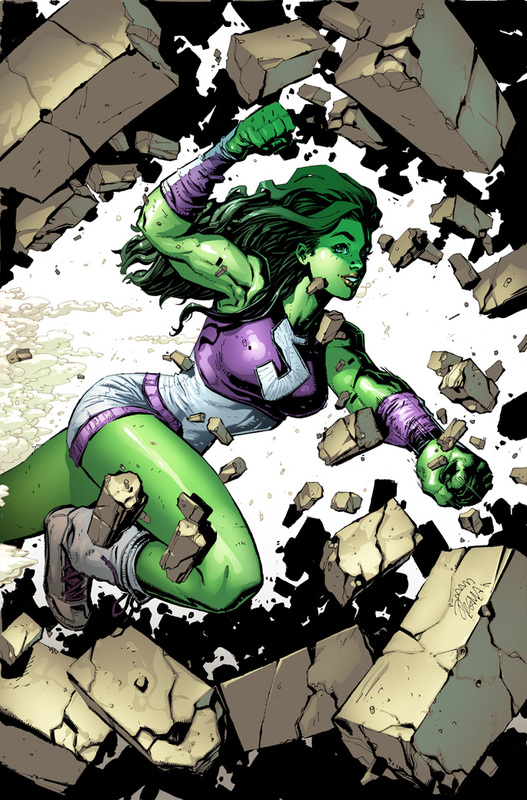 Why it won’t happen: Well… she’s Hulk but a woman. It’d be difficult to avoid accusations of being a derivative. Also, she hasn’t got the greatest rogues gallery of all time, so it’d be hard to get her a cool villain to fight. Captain America has Red Skull, She-Hulk has… Elephant Man. The inclusion of Pietro and Wanda in Age of Ultron proves that Marvel can get the X-Men into their films if they want them, but seeing as Fox will probably not let them have the likes of Wolverine or Storm, Marvel might have to do with the less well known X-Men. Of course, this means that they might end up using easily the most cinematic. 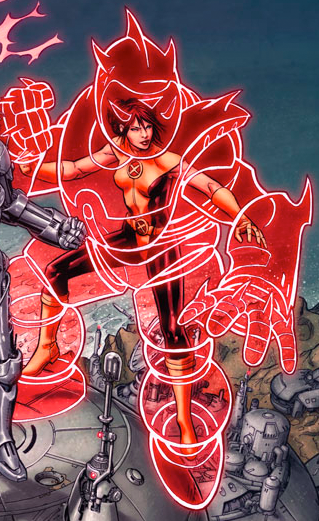 Hisako Ichiki is a Japanese woman with the power to make a suit of armour using just her mind. Oh, and it can grow to the size of a block of flats if she wants it to be. If the CGI was good enough, an Armor film would be a visual masterpiece; one minute you’re watching Iron Man, the next you’re watching Pacific Rim. Why it won’t happen: As I said, Armor is not very well known. Even casual X-Men fans aren’t too familiar with her, so there’s very little chance that a movie going audience would have much knowledge of her. Still, that didn’t stop Guardians of the Galaxy becoming a smash hit, so there’s hope. Strap in, folks. This is where it gets weird. 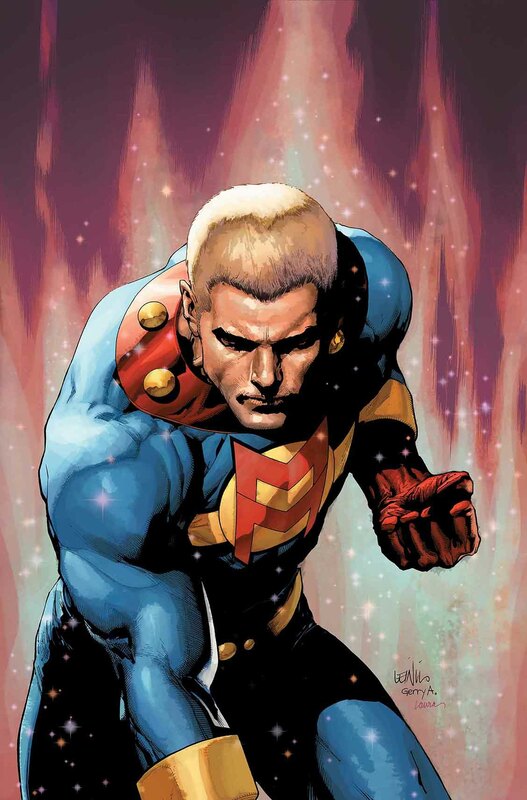 Miracleman, originally Marvelman, was a UK home-grown replacement for Captain Marvel (the DC one, not the Marvel one. If you’re confused now, then skip to number 2, because it only gets worse), which itself was briefly cancelled. Miracleman was one of comic book legend Alan Moore’s first works, and it is one of the most clever and dark deconstructions of the superhero genre ever written. Then another legend, Neil Gaiman, took over and made the entire thing even more subversive. Why it won’t happen: The Marvel Cinematic Universe gets dark at times, but is generally characterised from WB’s DC universe by how joyful, fun and light of heart it is. And Miracleman is… well… not. I doubt you could make a faithful adaptation of the original Miracleman stories without getting slapped by an 18 rating, and the very thought of that makes movie executives run for the hills. The alternative would be a heavily watered down kid-friendly version, and given the original story involves a businessman killing every single person in London, you’d need more water than Lake Victoria to water it down to even a 15. Welcome to the greatest 1970’s film never made. Cheesy Blaxploitation and Bruce Lee films are two of the finest things ever to happen to cinema, and Marvel has an answer to both of them. Power Man is basically Samuel L. Jackson but bulletproof. Iron Fist, meanwhile, entered a martial arts tournament and won the chance to fight a dragon made of kung fu. And when he beat it, he ripped its heart out. Together, the two roam the country making wisecracks and punching everything that they don’t like. Why it won’t happen: actually, it might. Marvel has already announced a TV miniseries for each of them. Agents of Shield was influenced by the events of the Marvel Cinematic Universe already, so a crossover between the TV series’ and movies isn’t off the cards. 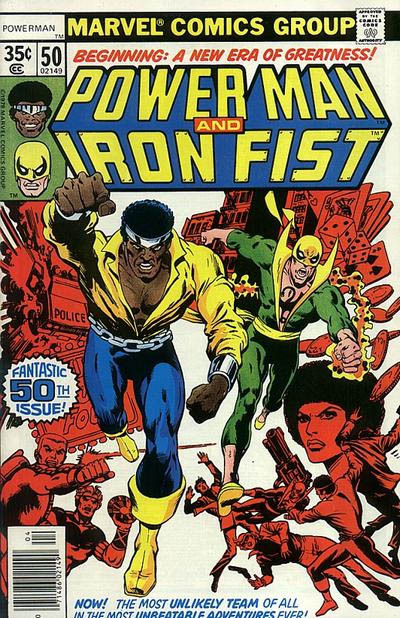 However, Power Man and Iron Fist belong in a 70’s throwback kung fu buddy comedy together. If that film existed, people would walk out of the cinema with afros and flared trousers they didn’t have when they walked in. You might have noticed that for all the diversity in powers, the Avenger’s line up is whiter than a snowman eating white bread at the North Pole. Given that Marvel is bringing Spiderman into the mix, Mile Morales would be a good chance to add a little diversity to Earth’s Mightiest Heroes. When The Amazing Spiderman 2 had disappointing box office returns, Sony buckled and let Marvel have the character in their own movies while still making their own. They’ve said that they’re looking for a younger Spiderman to take it back to its roots. 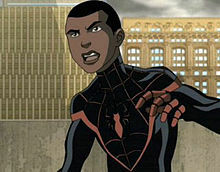 Oh, what a coincidence, Miles Morales happens to be younger than Peter Parker already, and his series, Ultimate Spiderman, was just about the only consistently popular part of Marvel’s Ultimate comic line. Why it won’t happen: Because you know who Peter Parker is. “Mass market appeal”, which every studio exec wants, is code for “exactly the same as every other movie.” And, yes, even in 2015, that means making sure that every protagonist is white (being male helps too; why do you think there hasn’t been a Black Widow film yet?) Marvel isn’t racist, but it probably thinks that everyone else is, and that’s probably because Hollywood keeps telling it that we are. Even in a genre filled with robot suits, talking racoons and Norse gods, a woman or a non-Caucasian lead is just too bizarre. That’s why a Miles Morales film probably won’t happen. It’s also why it absolutely should. For the record, Marvel can’t use Armour. The reason they were able to use Scarlet Witch and Quicksilver is because they’re more associated with the Avengers than the X-Men. It created a complicated situation with the rights, and neither side was entirely certain which way a court would decide, so they settled on making the characters available to both studios. This situation does not apply to Armour. She’s an X-Men character. There is no dispute over that. Fox would absolutely bring Marvel to court over that, and would easily win. So, yeah, Armour is off-limits, as are every other X-Men character. As said in the post, these are characters that Rob would love to see in the Avengers, rather than those that could ever happen. That’s not untrue, though plenty of X-Men are very much tied to the Avengers, and plenty of characters got their start in X-Men but seem very disconnected from them, like Cable. Hell, Storm was married to Black Panther, though she probably won’t turn up in the upcoming BP film because of the rights issues. As Adam pointed out, this is a list about what characters would make for good Avengers and why it probably wouldn’t happen, and there’s only so many words to write with, which is why I focused more on what would make for a good movie than on what’s actually likely. Honestly, of all of them, I’d say that Miracleman’s probably the least likely, not the least of which being the labyrinthine mess of legal battles surrounding him, though you are right in saying that if Armour did ever get a movie adaptation, it more than likely wouldn’t be in a Marvel film. Thanks for your comment and I hope you enjoy reading more that this site has to offer! I have a problem with any superhero universe, threres not enough non-white heroes. thanks to stan lee and the late jack Kirby theres ‘blade’ which the first installment movie was good. now marvel is considering in bringing the legendary black panther to the silver screen, their thinking of putting him in the next captain America movie, which in my opinion give the black panther a stand alone movie. which many new generation of comic book/movie fans , can see where the beginning of the origin of the black panther character came from.